Top Ten Tips for Homebuyers - NEW! All material here is copyright © 2006-2015 Jeff Lindsay. Appleton, Wisconsin is the Place! Jeff Lindsay's guide to eating out in Appleton and the Fox Cities. I enjoy dining out and find Appleton and the Fox Cities to have a rich variety of good restaurants. I've traveled to many cities and nations, trying many restaurants and many cuisines, and don't feel disadvantaged to live in Appleton. For those of us who want to get good value for our money and good food, Appleton is a great place to eat out. I've divided this page into two main sections: (1) Webmaster's Choice - a few of the places that I think deserve special attention, and (2) Other Recommendations for Dining. In the second category are some places I really like as well as some I'm not so sure about that others have recommended. I tell you what I think and always welcome your feedback. Meanwhile, recognize that restaurants are often in a state of flux. New ones open and old ones close--so let me know if I'm missing something. Sometimes my favorite places close, as Confucius Chinese did recently, and Cherry on Top ice cream in Neenah. Sigh. Sweet memories at both places! Blueberry Hill has also closed--will miss those great pancakes. Here I discuss places in the Fox Cities that I think deserve some kind of award for what they offer. Give them a try and let me know what you think. A classy place with outstanding Asian food with influences from China, Thailand, Korea and Japan. Brilliant flavors, excellent service, pleasant setting. In 2015, a luncheon of international significance was scheduled to welcome two Chinese dignitaries coming to town to attend the Paper Industry International Hall of Fame annual dinner, where an ancient Chinese inventor would be recognized. I worked with some people in the Chinese community of Appleton to make this a special and delicious luncheon. The place that was recommended to me for the event was GingeRootz. While the Fox Valley has a surprisingly strong group of Chinese and broader Asian restaurants, GingeRootz has a great reputation and really great food. They also have one of the nicest and most useful websites I've seen for a restaurant. Open daily from 11:00 AM to 9:30 (10:00 on Fridays and Saturdays). 2920 N Ballard Road, Appleton, WI 54911. Phone. 920-738-9688. Email. info at gingerootz.com. Tell them Jeff sent you! One of Appleton's nicest and most delicious restaurants. After a recent trip to Greece, I appreciate the rich Greek cuisine at Apollon all the more. I recommend Apollon for Good Greek food in a pleasant setting. Many other people in the Fox Valley agree that it's an utterly superb restaurant with great service. Awesome dolmades, great egg and lemon soup, delightful lamb and excellent seafood, and seafood that is not overcooked. This establishment, so close to the PAC, is quite popular for dinner just before a big show, so be sure to get reservations if there's a major event that night. A few years ago I had to entertain some very important business guests and wanted a classy place with a sure-fire positive experience. While many possibilities crossed my mind, I settled on Apollon and scored a victory. Three of us tried their swordfish steak and it was terrific. Very rich in flavor and not overcooked. Another man had a lamb dish and was very impressed. If you like lamb, Apollon is the place. Background music was pleasant. Service was excellent. More recent visits have also amazed me times. One dish, orange roughy with pesto, was absolutely perfect. I described that experience in the post "Perfection at Apollon" on the Appleton Blog. Later, I took two friends from Europe there. From Macedonia and Montenegro next to Greece, they were familiar with fine Mediterranean food and were impressed with the meal. I was truly transported by the best Moussaka I have ever tasted. Moussaka can be a bit boring sometimes, but not the way it is prepared at Apollon. I asked the chef about it afterwards, and was pleased to learn that he actually won an award at an international competition in Europe for his Moussaka. The sauce on it is what really brings it to life. Just amazing. An acquaintance of mine recently had visitors from the East Coast spend some time with her here in Appleton. The visitors were joking about what they would be able to find for dinner in a Midwest town like Appleton, thinking that Pizza Hut would the most elevated cuisine that our "flyover village" might offer. My acquaintance took them to Apollon, (207 N Appleton St., just a few yards west of the Appleton public library, as their map indicates - (920) 739-1122). Apollon offers high-quality authentic Greek food in a pleasant setting, an excellent choice for visitors used to high culinary standards. As they were enjoying some impressive food, beautiful notes from a female voice sounded in the background. At first they thought it was recorded music being played over a sound system, but they soon noticed this was live. In fact, a fabulous singer was providing live operatic entertainment in their restaurant - and it was tremendously beautiful. It turns out that the woman was a Greek opera star whose son attends Lawrence University, and she was visiting him that week. While in town that night, she kindly offered a little operatic flare for her fellow Greeks at Apollon. The visitors were wowed at the combination of food and entertainment they found in Appleton. My acquaintance shrugged her shoulders and said, "Yeah, just a typical night in Appleton." Carmella's, an Italian Bistro gets my nod for the best Italian food in the Fox Valley, if not the best food overall. They've received a lot of awards in the Valley for their food, and with good reason. It's somewhat more expensive than many restaurants in the Valley, but for the quality, you could say this bistro is still a real bargain. The story behind Carmella's is that two sisters with an amazing Italian mother decided to write down all her recipes and offer their favorites to the rest of us. Thus Carmella's was born. You can view their menu online: creative salads, paninis, main courses, desserts and more. Each is crafted with attention to detail and marvelous flavors. "They get it, they really get it," I said to myself when I ate there. Just their selection of cheeses reveals that they really get good food. Mmm, what cheese! It can get crowded and some people report that service can be too slow during peak times, so choose your time carefully and make reservations. Then be patient. It's also a lively place, so if you want a quiet conversation, it might not be the right choice. But for the food, it's hard to beat. Carmella's is tucked into the corner of a strip mall by the Fox River Mall, next to Penzey's Spices and close to Chili's. 716 North Casaloma Drive, Appleton, WI. Phone: (920) 882-4044. Asian Thai opened in 2010 with a delicious menu with both Chinese and Thai dishes. The chef seems skilled in both cuisines--both styles were nicely prepared. I was wild about the Chinese stuffed eggplant dish--one of the best eggplant dishes ever, with crisp skin and delicious shrimp stuffing and a perfect hoisin sauce that made it irresistible. The brown rice we chose was surprisingly good and made the meal even more hearty and delicious. Service is very professional and friendly. A great place for lunch or dinner. The ambience is classy, bright, and quiet. Highly recommended. They are on Northland Avenue right next to Koreana: 201 W Northland Ave # E, Appleton. Phone: (920) 734-6888. Note: the link is to Asianthaicuisine.com via a secure link TinyUrl.com since the target website lacks secure https ability (SSL), which my site requires. After experiencing some of the world's best cuisine during a year in China, I returned to Appleton for a visit and made my first stop, just moments after getting off the plane, at Five Guys, the popular new chain that has finally come to Appleton. This creative hamburger joint, with roots in Milwaukee, serves customized burgers that can, if properly selected, top almost any other burger you've had. Creative, fun, fresh, delicious, and one of the most popular choices for burgers in the Midwest. Even the veggie burgers are awesome. Give them a try! HuHot Mongolian Grill is one of my top picks for exciting dining in Appleton. It's a Mongolian barbecue with the best ingredients and sauces I've seen for this kind of restaurant. It's all you can eat for about $14 a person (dinner) - not bad for such high-quality all-you-can eat food. The decor is fresh and attractive and the service is great, including the talented cooks who manage to keep track of everybody's customized food as they grill it for it you. I recommend you avoid peak times, like early Friday evening. The line to get your food becomes too long. Lunchtime can also get busy. One of many positives is that they can accommodate the needs of people with various food allergies, though it may take a little longer to properly prepare your food. I was pleased to see that salmon was one of the choices for ingredients (other meats include chicken, pork, and beef). There are also three different kinds of noodles. I like the Thai rice noodles and the Chinese lo-mein-style wheat-based noodles. A scrumptious selection of veggies is available, all remarkably fresh and attractive. I loaded up on cilantro, broccoli, and other items. One thing that really sets HuHot apart is the rich variety of sauces, about 20 in total as I recall. In addition to the basic sauces like ginger water, lime, sesame oil, etc., they have a great selection of premixed complex sauces such as Black Thai Peanut, Yellow Belly Curry (with coconut milk), and "Kung Pao...Yow!" I was also impressed with the salad that came with my meal. Beautifully prepared with elegant dark green lettuce and a delicious oriental salad dressing. Given how quickly the bowls of food are cooked, HuHot could almost count as fast food. But it's also an elegant and classy place for a special occasion or a treat for the family. You can get Mongolian barbecue at several other places in the Fox Cities, such as China King in Oshkosh, and Asian Garden in Appleton (Mongo's is now closed), but HuHot was the most enjoyable for me. I'm anxious to go back! Highly regarded new Asian restaurant in Appleton with food from Indonesia and Malaysia, with good vegan choices. Many happy customers who find the flavors rich and exciting. Excellent place to consider. Some say it's the best restaurant in Appleton. 1915 N Richmond Street, Appleton. Phone: (855) 665-6740. See the Yelp reviews. A big success! Gyros Kabob for years was hidden away in a little cranny at Soldiers Square. Business was good, in spite of the awkward location - it's hard to keep great food a secret! Then they expanded to a more prominent location at 205 W. College Avenue, and then in 2010 moved back into the original but now expanded space, adding space once occupied by Cobblestone Deli across from the Avenue Mall at 119 East College Avenue. The official address is 118 Soldiers Square. What you need to remember is this: they make the best gyros in town. The owner and super cook, Josef, has quite a story (you can read it on their Website) and is a very kind and energetic human being. And he understands what gyros are meant to be. The pita bread alone is worth a visit: tender, tasty, and lightly toasted just before being served. A variety of gyro and kabob-based pita sandwiches are offered, along with baklava for dessert and a few other items. I thrilled four people for under $20 recently for dinner. Open for lunch also. Call 920-830-9355. He has a second location in Neenah, Gyro's Kabob, in the place once occupied by Sassy Sal's on Wisconsin Ave. almost next to Hong Kong Buffet and Zacatecas. Very popular! It's exciting enough that Korean food has finally come to Appleton - but we're talking about EXCELLENT Korean food and excellent sushi. This started as a small extension of an oriental grocery store in 1997, but in 2000 moved to a spacious location on Northland Avenue with a major upgrade in the menu. This is one of my favorite restaurants. I am simply delighted with the great flavors. Plus the place is attractive (one of the most beautiful interiors of any restaurant in the Valley), clean, with rapid service. Bee-bim bop, bulgoki, noodle soup, and many more dishes are featured on their menu. 201 W Northland Ave, Appleton, 54911 - (920) 733-3205. Selecting a winner for best sushi in the Fox Valley is very difficult. Appleton has long had great sushi at Koreana (delicious, high-end), Far East, Nakashimas, and Fuji Sushi (a buffet with perhaps the best value for hungry sushi cravers), not to mention the relatively recent addition of Dong Po's sushi bar and limited sushi offerings (mostly in the style of California rolls) at Asia Garden, Hong Kong Buffet in Neenah, and some other places. But in late 2010, we had a surprising sushi surge on the southeast side of town. Sushi has become rather popular in the Fox Valley. I first ran into Noodles and Company in downtown Madison, where I was anxious to try their cuisine but deterred by a long line of locals (mostly students) trying to get into this popular place since I was in a hurry. The new (2005) Noodles and Company in Appleton does not have that problem (at least not yet), so I've been able to try it twice now with members of my family - and we've been thoroughly impressed. 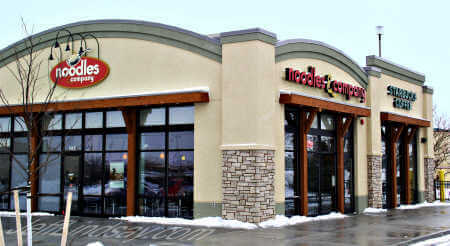 They offer a variety of outstanding noodle dishes covering Asian, Mediterranean, and American style food. The Asian dishes have bold flavors as fine as much more expensive restaurants. The Japanese pan noodles (udon) are outstanding, as is the Pad Thai, Bangkok Curry, Curry Soup, and Italian Penne. A typical dish costs $5 (I added the "vegetable trio" for another $1.75 - not needed but I love lots of veggies), and they will let you customize your meal as well. And if you don't like the flavor, they will adjust it or replace it. My Bangkok Curry on my second visit had a weak flavor, but they quickly brought me a little dish with additional sauce that brought the meal to perfection. The service is incredibly fast - you may have your food within five minutes or less from the time you order (about 2 minutes on my second visit). You pay at the order counter and they bring the food to your table if you are eating in. They also have a drive through - an indication of how quickly the dishes can be prepared. But it doesn't taste like fast food at all - the quality is outstanding. One sign of quality, in my opinion, is their choice of hot sauce on every table: my favorite Huy Fong Sriracha chili-garlic sauce. First class! I also recommend their flatbread - a delicious pancake-like bread for just 65 cents. Very tasty. And they offer some of our favorite trendy soft drinks, including excellent cream soda and Wisconsin root beer. They are on the north side of the Fox River Mall, at 4333 West Wisconsin Avenue. Open 11 AM to 9 PM Sun-Wed, and until 10 PM the rest of the week. Phone: (920) 734-4859; fax: (920) 734-4895. Also be sure to get a frequent eater card. I can praise the Red Ox on south Oneida Street for many reasons--great sandwiches, wonderful menu for meat and fish, good desserts, and a warm but casual atmosphere--but the tuna steak sandwich during an August 2010 visit vastly exceeded expectations. I give it my award for the best fish sandwich in town. The chef at Red Ox understands that fish does not have to be overcooked and rubbery. In fact, if a customer asks for it medium rare, as I did, then medium rare it is. The thick, fresh, and surprisingly large tuna steak is cooked with a nice mix of Cajun spices and served with a delicious sauce on a bun. It was eye-opening good! Have never had a tuna steak that was so delicious. Kudos, Red Ox! A Dec. 2009 post on the Appleton Blog praised the Red Ox for the best Philly sandwich in town. (Link is to www.redoxseafoodandsteakhouse.com but via a secure TinyURL.com link, since the restaurant site does not support https URLs as required by my website.) I've been on a mission to find the best Philly, ever since falling in love with authentic Philly cheesesteak sandwiches while on a trip to Philadelphia. There are some good choices in town, but the Red Ox please my palette best in that crucial category. But they go way beyond that by offering one of the most interesting menus I've seen, especially for lunch. Twelve varieties of salmon? Awesome. Lots of great sandwiches, steaks, salads, and fish to choose from, and great deserts. The restaurant has changed a lot inside since I was first there maybe 10 years ago. Nicely remodeled, pleasant smell, cheerful and quiet. I've been there twice for lunch. Most memorably, I tried the prime rib Philly sandwich. Outstanding, even if it departs somewhat from Philadelphia-style Phillies. The prime rib was so tender - thick, juicy pieces. The bun had the perfectly crisp interior toasting that adds crunch and flavor to a Philly. Real cheese was used, not processed cheese, which I greatly prefer. Mushrooms were grilled just right. It's served au jus. My friend tried one too and was also impressed. The Red Ox Supper Club is at 2318 South Oneida Street, Appleton, WI. Phone: (920) 830-4121. Tell them Jeff sent you! Victoria's offers good Italian food at low cost. Very large quantities (ok, TOO large, in my opinion) are a trademark of this place. I've entertained well-fed people from the east coast at Victoria's and they were really impressed, so it's pretty good. I've been there many times with people from different walks of life, and consistently find that Victoria's please most people most of the time. Huge variety of dishes, though sometimes the emphasis seems to be on quantity rather than quality. Nice decor, great service, and a large variety of people-pleasing-platters. Personally, it's not my favorite Italian, but for the price, it's not a bad choice. A few years ago I tried a fish fry at Waverly Beach in Menasha (at the southern end of Oneida Street on the lake) and it was pretty good. Went again in May 2009 and it was even better. Most of the activity at Waverly these days seems to be in the large bar area, but behind the bar overlooking Lake Winnebago is a reasonably sized dining area with good service and excellent, inexpensive food. And I really love the view of the lake. My wife ordered a seafood combination plate with shrimp, haddock, perch, and scallops. All were deep fried. I am not normally a fan of deep fried food, but it was done so well at Waverly's that I couldn't resist. The breading was light and thin, so it didn't overwhelm the seafood or cover it in grease. What really impressed me was that at least three different batters appear to have been used: a spicy batter for the shrimp, a light batter for the perch, and a traditional batter for the haddock. I'm not quite sure, but the point is that they different seafood items were all prepared in distinct ways that helped bring out the flavor, instead of everything being treated the same and tasting the same. The scallops were perfect - not overcooked. The haddock was my favorite, but the shrimp was also excellent. I ordered a Philly sandwich with prime rib. The meet was sliced fairly thick compared to the normal Philly style sandwiches, but was very good. Nicely seasoned. I enjoyed it - but especially enjoyed nibbling at my wife's food. A reader with a lot of experience in Mexico first alerted me to the opportunity for authentic Mexican food at Antojitos, one of the best places in town with some of the most authentic Mexican food you'll find. Formerly on Richmond St., they are now at 204 E College Avenue, right in the heart of town. Phone: 920-380-0244. Antojitos Mexicanos offers inexpensive Mexican food with great flavors. Their tacos, for example, are unlike the tacos found in most Mexican restaurants in the US, but are the perfect double-corn-tortilla open faced treats that I love. Real gorditas, too - greasy but delicious. A highlight of one visit was the fish tostada - an impressively delicious mixture of tender fish and rich flavorings on a crisp tostada. And yes, they have horchata, my favorite Mexican rice drink. The food is quite inexpensive. The tortilla chips are homemade. Service is fast and friendly. The decor and tables are suited for a fast food place, so don't expect fancy - but do expect tasty. Asian Garden, formerly Great Wall Chinese, is a good Chinese buffet conveniently located near the Fox River Mall at 405 N. Mall Drive, Appleton. The restaurant features a large spread of items, rivaling that of Hong Kong Buffet in Neenah. It's an OK choice for lunch, with comfortable booths and a quiet atmosphere. The food can be good but quality isn't always superb. At least when I was there last the buffet included a Mongolian barbecue, but the selection of ingredients was relatively small and the cook prepared only one person's food at a time, resulting in a painfully slow wait during busy times. I suggest skipping the Mongolian barbecue and focusing on other items, including the good California rolls and excellent variety of fruit. Open all week long. Phone: (920) 954-8888. This chain from the South has become quite a hit in this far corner of the North. It's one of my favorite places for a good low-cost meal. I recommend a half-and-half combo (half a sandwich and a soup) with the soup upgraded for $1 extra to a bread bowl of soup. You can also buy loaves of excellent crusty breads. I once took six friends there and they all were pleased with my recommendation of the half-and-half with soup in a bread bowl. I got positive feedback on their chicken chili and their potato soup. i tried the roasted red pepper soup with feta cheese and was impressed with the rich flavors, though perhaps the soup would be better with a little less oil in it. The California Avocado sandwich is a particular favorite of mine, and also got good reviews from those that tried it. On the down side, their bagels are dense and relatively flat, so don't bother. Just about everything else is outstanding. They also have wireless Internet access. Location:: 650 N. Casaloma Drive just west of the Mall, in the same parking area as DSW Shoes, phone (920) 735-1540 (they closed a second location in Darboy near Wal-Mart - I think the traffic problem there hurt them). After a couple trips to New York City, my bagel awareness is at an all-time high, and I've been on a quest for Appleton's best bagels. While several bagel shops and bakeries sell a lot of bagels to hungry Fox Cities dwellers, I hadn't found true bagel greatness in the area until last month when I walked into Big Apple Bagels. Oh la la! These people know their bagels, bagels that come close enough to actual New York bagels to fool most non-New Yorkers. While a quirk in the laws of physics actually makes it physically impossible for perfect bagels to exist more than about 30 miles outside of Manhattan, Big Apple gets close enough for my taste. I'm delighted at the many fine varieties they offer. Their egg bagel is light and flavorful, for example. I have tried five varieties so far and think they've really got a winning approach. Delicious! They also offer a variety of sandwiches, smoothies, and other fare. Great place for a quick lunch! Big Apple Bagels can be found on the west side of town at 2601 W College Avenue, phone: (920) 739-0618. A second location for you east-siders is near the southeast Wal-Mart, across Calumet close to Kohl's: W3192 County Road KK, phone: (920) 733-3120. A relatively new Thai and Southeast Asian restaurant on Richmond St. (Highway 47). Very popular with excellent food. I took a group there recently and had a superb experience. Service was excellent and the food was flavorful and spiced well. Good ingredients, relatively authentic, nice environment, and relatively inexpensive. Around $14 per person. Tom yum soup is liked by many. Curries are very good, such as their green curry. Could be the best Thai in the Valley. What do you think? 1513 Richmond St. Phone: (920) 830-6741. An establishment with many years of experience and numerous happy customers, B.J. Clancy's offers breakfast, lunch, and dinner. Breakfast includes a wide variety of omelettes and other items. Lunch and dinner include burgers, sandwiches, salads, and excellent steaks. Good desserts, too. Friendly service. B.J. Clancy's is in south Appleton at the intersection of Oneida (Hwy 10) and Midway Road (Hwy AP), 3341 South Oneida. Hours: Sunday - Thursday 7:00 am - 9:00 pm, Friday - Saturday 7:00 am - 10 pm. Phone: 920-739-7938. Another fine chain with great food. Buffalo Wild Wings has two locations in Appleton, one at 4601 West College Avenue not far from the Fox River Mall (phone 920-830-4169) and the other on Calumet near Home Depot in the southeast part of Appleton (3201 E. Calumet St., phone 920-733-9464). I took a son to the one near Home Depot. Very impressive chicken! We had chicken legs on one of their "chicken leg Wednesdays" in several flavors -- garlic, hot pepper, blue cheese, teriyaki. They have some of the best sauces for chicken you'll ever find. A lot of good food for not too much money. Reasonably good Italian place. My early experiences there were great, though I've seen some complaints from others since then, so I'm not sure now. But a few years ago, my wife and I took a visitor to dinner at Cannova's Pizzeria in downtown Neenah (113 W Wisconsin Ave, Neenah, WI). This is a classy restaurant that offers great pizza and some outstanding Italian dishes. My friend, a scholar and traveler who spends a lot of time in Europe, was impressed. We went on a cold Thursday evening, and the place was packed, but we got the best table in the house at the front window. I was impressed with the salad, a very nice mix of hearty ingredient, and then truly delighted with the lamb chops, the special of the day. Honestly, I have never tasted better lamb. Perfectly done! And so tender. The lamb was presented on a bed of risotto with beets on the side. Very pretty. The risotto was a little too "al dente" for me, but was very good nonetheless. And the beets were outstanding. My wife tried the scallops and was pleased. Our guest tried another pasta dish and enjoyed it as well. But I think I had the best of the three dishes. The selection of deserts was hard to resist. I kept things light with a simple orange sherbet, but it was a high quality version. Service was very good. The place is attractive and lively, but not too noisy - no hideous music blaring. Easy to have a conversation. A little east of the huge Regency cinema on College Boulevard (Hwy CE) east of town, the China Dragon Buffet offer a good Chinese buffet. They have many Chinese dishes, several soups, plus desserts, fruits, salad items, and vanilla and chocolate soft ice cream (relatively low-fat for reduced guilt, the way I like it, though some won't care for this). I don't think they use MSG (no MSG aftertaste hits me after eating there). I previously gave this a Webmaster's Choice Award for best Chinese buffet, but now I'm not so sure. They seem to have changed management and made some changes in the food, so the last time I was there was not quite as good as I previously experienced. Maybe just an off night. The lunch buffet is open from 11:00 a.m. to 2:30 p.m. Monday through Saturday, with the dinner buffet from 4:30 to 9:00 p.m. Take-out is also offered, and China Dragon Buffet now provides broad delivery service for all of Appleton, Menasha, Kimberly, Little Chute, Combined Locks, Kaukauna, and even the Sherwood Area. Call (920) 830-8158. The address is W3169 Van Roy Road, Appleton, WI 54915, but think of it as being on the south side of College Avenue (Highway CE) near Kimberly just west of Eisenhower Drive. It is about one block west of Regal Cinema, next to the new Big Lots store. From College Avenue, turn south on Eisenhower and immediately turn right onto Van Roy Road or into the Big Lots parking lot. China Garden has been in business since 2006 in Darboy at W6141 Country Road KK (Calumet Street) just a couple blocks east of Wal-Mart (W6141 County Road KK, by the Tanglz Salon). I've been there twice now and find it to be surprisingly good, inexpensive, with a friendly and entertaining atmosphere, thanks to the charming personality of the owner. It's a small restaurant that seems to do most of its business as take out, so it probably won't be crowded when you go - and that means the charming owner will be able to visit with you. He is more native Appletonian than I am, since he came here at age 9, but he went back to Hong Kong for several years of education and has a rich Chinese heritage that he shares at China Garden. During my family's visits to China Garden, we've been pleased with several dishes. Recently we tried Wor Shu Duck, a crispy duck dish which, like Peking Duck, has a delicious skin. This was one of the best duck dishes I've had, coupled with excellent sauteed vegetables in a flavorful sauce. More duck than I expected. It's one of the more expensive items on the menu at just $10.50. It's more than one person can eat, I think. I was especially impressed with a vegetarian dish, the Home Style Bean Cake, which had fried tofu in a delicious sauce with sauteed vegetables. I was pleased with the flavors and surprised to see so much of this excellent food for just $5.95. We also tried Beef with Chinese Mushrooms and Bamboo Shoots ($8.65) and Triple in Garlic Sauce (jumbo shrimp, beef, and chicken with vegetables, $9.85). All very pleasing with a variety of flavors. The four dishes were more than four of us could eat, including two teenage boys. I think we could have fed five or six people with the four dishes we ordered. Previously we enjoyed the Chef's special called Happy Family, a combination of lobster, shrimp, scallops, chicken, pork, and vegetables. It's tied for the most expensive dish on the menu, at a mere $11.75. The hot and sour soup was excellent. The rich menu of China Garden emphasizes Szechwan, Hunan, and Cantonese dishes. Like most Chinese restaurants in the Valley and in the US, this one offers foods adapted for American pallets and employing readily available ingredients like carrots and broccoli that might not play such a prominent role in restaurants seeking to provide exotic, authentic encounters with the foods of the Orient. And that's just what you need when you're taking your family out to dinner - especially on a budget. China Garden is open seven days a week and offers free delivery (minimum order $18). MasterCard and Visa accepted. Open for lunch, with 32 different $4.95 lunch specials. Hours: 10:30 am - 9:30 pm Monday to Saturday, and noon to 9:30 pm Sunday. I believe no MSG is used. Call (920) 380-0058. Fax: (920) 380-0079. Be sure to say the tall guy with the family of four sent you. Small Chinese restaurant with a lunch buffet. Only a few tables, mostly for takeout, but a great choice. Very good soups and a great menu. Inexpensive. $5 for a quart of hot and sour soup - good stuff. I've used them for take-out a few times and have been pretty happy. Have also eaten there a couple of times. Nice staff. They are in Menasha in the Shopko Plaza area, just south of Highway 441 on Memorial/Appleton Road (Highway 47), next to Gold's Gym. 1770 Appleton Road, Menasha, WI. Phone: (920) 731-3088. While there are steaks on the menu (and they may be quite good), they are most famous for their charcoal-grilled burgers, brats, and chopped steak sandwiches, which are outstanding. The atmosphere at the two older locations is typical 60s greasy spoon/drive-in, while the East-side Kensington location is more hunting-lodge/sports bar mix (wood decor all around with quite a few TVs on the walls). You really are doing yourself a disservice by not visiting. It may even overtake Red Robin for your best burgers pick. A Wisconsin chain offering the best fast food around. Wonderful sandwiches, soups, fish, and especially their frozen custard! A classy place for fast food, but affordable. One is near Woodman's groceries and the other I frequent is on Highway KK (Calumet Street) in the south east part of town, just east of Highway 441. Dong Po is highly regarded for good Chinese food plus good sushi and Japanese dishes. I've been there several times and found it to be consistently good. The sushi is excellent, but it's Chinese food that I'm hooked on. Check out their menu. Be sure to try their house specials and seafood. Fox Valley Mexican food fans are buzzing with gusto about this inexpensive and fun new addition to the Valley. El Jaripeo offers relatively authentic Latino cuisine in a fun setting at low prices. Check out their menu and see for yourself. The owner is from Guanajuato, Mexico, where the cooking is delicious based on what I've tasted from my own friends from that part of Mexico, deep in the heart of the country. Reviews on Yelp.com are very positive. Said to be fast and delicious. Open 11 AM to 10 PM every day. They have two loThey've also got a second location in Greenville. They have two locations now. The original one is where a Hardees used to be in Little Chute (one reader calls it the "Mexican Hardees," but I think that's too complimentary of Hardees), on Main Ave in front of Hardware Hank/Piggly Wiggly: 1821 E. Main St., Little Chute, WI 54140. Phone (920) 759-9480. The new Greenville site is W6482 Greenville Dr. Suite 2, Greenville, WI. Phone (920) 757-6119. Both are Open 11:00 A.M. to 10:00 P.M. seven days a week. Let me know what you think! The Far East Restaurant on south Oneida Street in Appleton, near St. Elizabeth's hospital, is one I've stubbornly avoided for years. I had a bad experience with the previous restaurant in that building, and unfairly kept that mental image as a barrier. But in June 2007, after hearing several people tell me how good the sushi was, I decided it was time to ignore an irrelevant past and give it a try. Good idea! The Far East Restaurant offers some of the finest sushi in the Fox Valley, in my opinion. The unagi - fresh water eel - was the best I've had, done perfectly and beautifully with a delightful sauce. The combination plate of sushi and sashimi was truly a pleasant surprise, with remarkably rich and tender fish and wonderful sushi rice. The tuna and salmon were rich and full in flavor, and the squid was some of the best I've had, tender and more flavorful than usual. So much was a pleasant surprise. For three people, the cost, including tax and tip, was $72. That included two extra appetizers and four sushi orders in addition to the combination plate, which was priced at $38. (No drinks were ordered.) Everything is a la carte. Given that the Fuji Sushi buffer is $12 a person for dinner or $10 for lunch, as I recall, the Far East Restaurant might be viewed as on the pricey side, but if you're looking for great sushi, this should be on your list. Ambience is pleasant and a bit dark. Quiet, comfortable. Excellent service. No complaints. Far East Korean and Japanese: 1330 South Oneida Street, Appleton, WI 54915. Phone: (920) 830-9810. Popular restaurant at the Fox River Mall. Not my favorite place, but people often love the food and I've heard they especially like the beer. There have been some complaints on the food, though, so you might want to check with Yelp to see how they are doing recently. There's a lot of history to Frank's and a buzzing, excitement atmosphere in this place that brought pizza to the Fox Valley over 50 years ago. Give it a try! They also great root beer in a chilled glass mug - they way A&W used to. Fratello's Waterfront is a fun pasta, steak, and seafood place on the north shore of the beautiful Fox River in what used to be the high-end and obscurely named "J a Restaurant" near Oneida Flats, about 100 yards downstream of the dam beneath the Memorial Drive bridge. I've been there about several times and have been please with the food and the setting. Well presented, stylish, and delicious. Midrange in price. Beautiful setting and good service. Their white chicken chili has my vote for the best soup in the Valley. Also loved the tuna ahi lollipop appetizers! The gnocchi is also terrific, as was the butternut squash ravioli my wife ordered. One of the best views in the Valley. Fratello's Waterfront is located at 501 W. Water Street, which is the road on the north side of the river along Oneida Flats. It's just west of the Paper Industry Hall of Fame, right where Water Street turns away from the river and heads uphill (about two blocks west of the Lawrence Arts Academy). Love the place. In March 2007, I went to Fuji Sushi at 1003 West Northland Avenue, on the south side of the street across from Northland Mall. Very impressive! This is a clean and delicious buffet with real sushi (salmon, clam, tilapia, etc. ), many varieties of sushi rolls, several excellent Chinese dishes and some good deserts. Spartan decor but excellent food. For lunch of dinner, the cost is about $10 per person. One of the best choices for sushi, especially if you don't have a lot of time. Koreana still has the best sushi in town, in my opinion, but if you want sushi in a buffet setting, you won't beat Fuji Sushi! (Also see my post on the Appleton Blog.) Others in 2012 have written that it's the best lunch in town. Not sure about that, but it is a fabulous choice. Closed Mondays. Phone (920) 832-1388. A while ago I took some of my family to Galvan's Restaurant, 2220 E Northland Ave. by the Superbowl bowling alley. Galvan's is a family diner that has been praised for their gyros. They also offer basic sandwiches, soups, pies, etc. Fairly inexpensive and generally OK basic food is my take, but there were a couple glitches. I started with an order of their soup of the day, seafood gumbo - but they were all out of that. This was a bit late, around 8 PM, but still, that's a real shame. They also offered white chicken chili and regular red chili, or so the waitress claimed, so I ordered a bowl of the red chili. What was served me was a version of refried bean soup, similar to a recipe that my wife has used, but far less appetizing because this version had a lot of cream in it. I think the ingredients were cream, pureed refried beans, tomato chunks, chicken, and chili spices. It was an awkward combination with a coarse, almost gritty texture and did not seem to fit into any chili category that I was familiar with. I couldn't finish it. The gyro was good, except that the white sauce was based on sour cream instead of yogurt used with "real" gyro dishes. I'm sure many people prefer the fattier sauce, though. Others had a basic hamburger (looked OK) and a Reuben sandwich that was good but was inadequate when it comes to the sauce that should be inside on the bread - just not enough or not tasty enough to enhance the sandwich. On a later visit, the salmon with broccoli was quite good, as was the soup. Probably a good place to try when in the area. A lively, long-time-standing restaurant on the corner of Richmond Street and College Avenue with a diverse menu ranging from burgers to Italian and Mexican cuisine. Dishes are reasonably priced and generally good. While I've had negative reports about the Mexican dishes, the Italian food tends to be very popular, especially the lasagna. I recently tried the linguine Alfredo and found it bland, as were some other pasta dishes, though still OK. Many people love the place. It has great old-style ambiance, with some amazing photos of movie and TV stars from 40+ years ago, along with other relics of the previous century or beyond. Worth a visit just to see and enjoy the interior, but enjoy the food also! On West College Avenue in the building once occupied by Los Compadres. Great pizza, paninis and sandwiches. Big salads. The crust on the pizza is the way I like--medium thickness, well cooked and flavorful. Their vegetarian pizza may well be the best veggie pizza I've encountered. They get it. Glass Nickel has its origins in Madison. I believe this is the second shop the team of owners has opened. Take a look at the bar where you'll see beautiful art made with thousands of nickels embedded in an epoxy coating. Very cool. Service is great. One of my favorite Chinese buffets, with what may be the biggest selection in the Fox Cities (close to that of Big Shanghai Buffet). The buffet even includes some decent but low-cost sushi. A great place for lunch. Good chicken and beef dishes, plenty of broccoli variations, a baked salmon dish is always there, a load of fried things in addition to vegetables and healthy fare, plus soft ice cream. 145 W Wisconsin Ave, Neenah. Phone: (920) 720-7089. Located in the Radisson Paper Valley Hotel (333. W. College Avenue), this classy and elegant restaurant offers what may be the best steaks in the state. I went there with a gift certificate recently and was simply amazed at the quality of the food - a meal I will not soon forget. But it is expensive. Without drinks or dessert, you can expect to pay $30 for a typical meal. Three of use shared a 30-ounce porterhouse steak and an order of crab legs, plus two of their large sides dishes (the garlic smashed potatoes were fantastic! ), for $85 plus tip. Open daily, 4 PM till midnight. Call 920-380-9390 for reservations. Casual dress is acceptable. Friends from California recently tried it for breakfast, lunch, and dinner. They thought breakfast was especially good. Also took a big group there for breakfast recently (summer 2016) and we loved the food and service. Need good home cooking at a low price? Looking for a fast bowl of soup and slice of pie? For full meals or just dessert, Mary's has been a real tradition for many in Appleton. Not very fancy and not very exotic, but good food and service at a low price makes Mary's a useful addition to anybody's dining list. (A nice place to take someone who doesn't like ethnic food.) Two locations: 2312 North Richmond or 2106 South Oneida in Appleton. La Michoacana is relatively new Mexican place. They began in Menasha around late 2010 and have now moved to downtown Appleton at 207 N Richmond St. They have some of the most authentic Mexican food in the area, according to one Mexican friend of mine. Also some of the most affordable. You can have a great meal of large tacos for just a few bucks. From the state of Michoacan in southern Mexico, corn tortillas are the norm here with terrific flavoring. You'll find some items you've probably never seen before, such as the torta ahogada, a wet sandwich covered in chili sauce. I loved it! But the less challenging tacos, tamales, burritos, enchiladas, sopes, tortas, and other dishes are also great and surprisingly inexpensive. Oh, and they serve horchata, a Mexican drink made from rice, sugar, and a touch of cinnamon. This Chinese restaurant in Appleton (opened around the beginning of 2003) offers reasonably priced and well spiced Chinese food. The lunch buffet and dinner buffets are inexpensive. They offer some California rolls and a variety of hot dishes. Not a huge menu, but adequate and generally good food. The dessert area also includes lychee nuts and other unusual items. Min Du is at 100 West Wisconsin Avenue, about 2 blocks west of Richmond Street, in a strip mall on the north side of Wisconsin. (920) 731-3327. Included here by popular demand! This restaurant offers showmanship from the cooks and great food. Two of my son have been there and loved it. A favorite restaurant of some visitors to Appleton. Based on recent reports, the sushi is excellent and the showmanship of the chefs is entertaining as they chop and prepare food. 4100 W Pine St. near Highway 41. (920) 739-6057. It's a chain, but one with fabulous Italian food. Unfortunately, there is a risk of HUGE wait times. Reminds me of Yogi Berra's quip about a restaurant: "Nobody goes there anymore - it's too crowded." On a recent Saturday, we waited nearly an hour just to be seated. We could blame that on the weekend. But then my wife went with a small group on a Wednesday night and had another huge wait (over 30 minutes to be seated). Lots of empty tables, just not enough staff to handle the people who came. Now that's a problem. If you are lucky and get served quickly, try their truly amazing dish, "Ravioli a Portabello" (ravioli stuffed with a mushroom filling that's out of this world, if you're into mushrooms). Bonus: soft drinks, bread sticks, and the soup that goes with your entree are replenished for free, if you want them. It's near the northwest corner of the Fox River Mall, 1275 North Casaloma Dr. (off of Wisconsin Avenue). Ph: 954-8005. They don't accept reservations. Good place for breakfasts or lunch (dinner is no longer served). Located in the atrium of the Radisson Paper Valley Hotel on College Avenue. The Orchard Cafe has a relaxing atmosphere well suited for conversation. I've been there several times for business breakfasts and can recommend the Mariners Benedict dish as one of the best egg dishes you'll ever have. The quality of bread available in the Fox Cities has been on a healthy uptrend. Great places for delicious bread include Atlanta Bread Company near the mall, Panera Bread on west College Avenue, Great Harvest Bread in downtown Neenah, Breadsmith in north Appleton and Darboy, Dolce Vita on Kensington across from Best Buy, and several grocery stores. Breadsmith's granola bread is among my favorites, but the overall best shop, in my opinion, is Great Harvest in Neenah. Awesome staff, great selection of breads, and free samples that are big enough to almost be a quick meal. Their Woodstock bread is especially good. They also make sandwiches for you--delicious! Finally, Appleton has Panera Bread, one of the best national chains with food created by foodies to please foodies at a low price. Bagels, bread, sandwiches, salads, soups, and deserts. Their Asiago cheese bagel is one of their signature specialties that ranks among the best bagels ever. Cleer paninis and excellent soups will keep you coming back. Pick up a load of great bread while you're there. One of the best places for a fast, inexpensive but interesting meal. At 3320 W. College Avenue, near HuHot. Phone: (920) 733-7417. Fax: (920) 733-7419. Pasties, baked fresh daily at this shop, are a Midwest food item that is foreign to many visitors. According to John L. Hoh, Jr., of Milwaukee, "pasties were a meat-potatoes-carrot-rhutabaga concoction brought over from Wales by Welsh miners coming to mine copper in Michigan's Upper Peninsula and in the mines of Southwest Wisconsin. This Yooper delight is now available in Appleton." The Pasty Koop is at 135 E. Wisconsin Ave., across from St. Therese Church. Phone: (920) 830-0896. Hours: M-F, 5:30 AM - 6 PM; Saturday, 5:30 AM - 2 PM; closed Sundays and holidays. Drawing upon the cuisine of southeast Asia, Pooh Saan offers authentic dishes from Thailand, Laos, Vietnam and Indonesia at low prices. Plus they've got the best bubble tea (sometimes called "Boba tea") in the Vellay--tasty icy smoothies with large, soft tapioca pearls that go up the extra-wide straw. They come in several flavors. My favorite is strawberry-mango. Mmmm. My favorite dish there is the pho, the Vietnamese-Laotian soup with noodles, meat balls, fresh basil, and other goodies. Pho (sort of pronounced like "fur" but mostly without the trailing "r" sound) is a popular and fun dish. I went to Pooh Saan for the first time last week and it was just what I needed. It was quiet with a very warm and personable manager. He was very clear and patient in explaining everything AND it was all amazing. We weren't able to have the egg rolls because his wife is the one who is entrusted with this task and she was out of town. However, we had the spring roll and that was among the best I've ever had. The chicken laab entree is by far the tastiest dish, of any cuisine, I've had since I first had the love-love roll at Koreana. I highly recommend Pooh Saan and intend to go there in a bit to get my lunch that I've looked forward to having there all week. I hope his wife is back so I can sample the egg rolls that all my friends claim is the best. Also received a comment from Mary Mo, used with permission, recommending the Chicken Pho and the Pork Laab as excellent choices at Pooh Saan. Like Dong Po, the great Chinese place on College Avenue, Pooh Saan has a name that reflects a truly authentic Asian restaurant--a name that American marketers would never think of. Authentic and tasty. One of Appleton's newest restaurants is Pullman's in Trolley Square in the Oneida Flats area deep in the Valley, right next to the Fox River at 619 Olde Oneida Street. Such a beautiful view, right across the river from Fratello's and the Atlas Coffee Mill. Pullman's has a sports bar area with huge TV screens for watching sports events. We were seated in the restaurant area, which has very high ceilings with decor representing the brick walls of old city buildings. Lively, pleasant, and popular. The first time we tried to go there, there was a 45 minute wait. We got there very early on a Friday the next time, about 5:30 pm, and just barely got in before it got full. Cuisine includes American food such as burgers, fish, seafood dishes, popular sandwiches, steaks, and some vegetarian dishes. See the Pullman's menu online. I had the best lobster bisque ever there. Delightful! Almost enough to win my award for the best soup in Appleton for a while, anyway--though there are many contenders. The salads are excellent, as are the sandwiches. Call 920-830-7855. A chain, but a popular one with excellent food. In April 2010, I took my wife there and was impressed with perfect rainbow trout, outstanding side dishes, and delicious shrimp. The scallops that came with her meal were the midget variety that lacks the potential of regular scallops. But overall we felt the quality was good and the service excellent. I watched live lobsters in their lobster tank while waiting to be served. Interesting to see some alpha-male behavior as one or two doomed lobsters tried to bully the rest. What did they think they were achieving under such dire circumstances? Near the Fox River Mall (northwest side): 1200 North Casaloma Drive, Appleton, WI. Phone: (920) 749-0644. They don't take reservations. I really like their smoothies and their veggie burger. It's a chain, but a fun one. Located near Home Depot on the southeast side of town (Calumet and Kensington, on the south side of Calumet). Fun place! I had the Garden Burger - one of the best vegetarian burgers I've had. My son and daughter-in-law had another gourmet burger and a pasta dish and were quite happy with their food. The burgers might be considered pricey - around $8 typically, but that's a large portion with plenty to eat, including fries. Then the Hawaiian Heart Throb Smoothie really won me over - absolutely delicious, almost as good as the ones I make. It came in a beautiful, artsy glass that I was tempted to photograph (but refrained). Service was very friendly and attentive. And you can tell that the people there, both customers and employees, are having fun. I like that. N109 Stoney Brook Rd, Appleton. Phone: (920) 733-8750. A pleasant, quiet restaurant in the heart of Neenah is Remington's inside the Holiday Inn Neenah Riverwalk Hotel (formerly called the Valley Inn), 123 E Wisconsin Ave, Neenah. Remington's has a number of beautiful brass sculptures featuring the famous Western-themed work of Frederic Remington. Most are reproductions, but one by the restaurant and one behind the front desk of the hotel are originals. Beautiful! I've been to Remington's for breakfast, lunch, and dinner now, and thought they did a good job each time. It's basic American fare at reasonable prices with good service. One thing my wife and I noticed was that the amount of food was right - not an overwhelming pile of calories or a skimpy nugget or two, but enough for a good meal without regrets. Phone: (920) 725-8441. Sai Ram was the first to bring excellent Indian food to Appleton. Located on the north side of town at 253 W. Northland Avenue (ph. 733-3003). For lunch, they offer a superb buffet that is as good as what you'll find in the highly touted Indian restaurants of Chicago or other big cities. The owners and hosts are kind, warm people that add to the experience. A real favorite of mine! They offer some spicy dishes, but most are within the range of typical North Americans. Their nan bread is usually excellent, and their meat and vegetable dishes tend to be richly flavored and prepared with care. Enjoy! A chain, but one of the best, in my opinion. An outstanding deli with some tremendous hot sandwiches. Great bread is the key, made from scratch, I understand. 881 North Casaloma Drive, Appleton. Phone: (920) 731-7272. Formerly Jet Sushi and before that, Sapporo Sushi. Island Sushi continues the tradition of a great sushi buffet at this location, 62 Eisenhower Drive, Appleton, just north of Calumet in the strip mall on the east side of the street across from Kohls. Phone: (920) 993-2222. It may not be the best sushi you've tasted (according to one sushi critic I respect, but the reviews at Yelp are highly positive), yet they have one important secret advantage: they deliver. A family in east Appleton reported to me that they had an OK sushi meal recently that was actually delivered by Island Sushi. Delivery may not be available for all locations nor at all times, so don't have unreasonable expectations, but when there's a polar vortex or something sweeping across Appleton, it's nice to stay home and let someone else bring the sushi to you. Island Sushi is on Facebook at www.facebook.com/Islandsushibuffet. Keep those sushi boats sailing! A new low-cost family restaurant with a surprisingly diverse menu and generally OK food (not great, though). There is a children's menu and specials for seniors as well. The 5,600-square-foot restaurant seats 180 people. It's next to Lawrence University's Banta BowlIt's at 1401 E. John St. If you're coming from downtown, take College Avenue east across the bridge, then at the intersection, continue toward the right, heading southeast on John street. It's just past the intersection on the right at a site that used to be a Hardees, close to the Banta Bowl of Lawrence University. I took six people there and we were generally very pleased with the soups (outstanding!) and the entrees. Warning: my key lime pie had a stiff, high-fat green frosting on it that destroyed the pie. 2008 update: Went there again and found some of the food on the disappointing side. A quality review is needed, in my opinion. There are three Soleas in the Valley. The one I tried most recently (Dec. 2012) is the Appleton Solea on Casaloma Drive, just east of the Mall close to Integrity Drive. One of my past choices for best Mexican food in the Valley was Solea. Solea is definitely a winner. It's Neenah location is perhaps the most upscale Mexican restaurant in the Valley. The original Solea Mexican Grill is at 709 N. Appleton Street in Menasha, formerly Los Compadres. In late 2008, Solea expanded by opening a classy new restaurant in southern Neenah at 1350 Gillingham Road in the building that used to be Gulliver's, just a few yards west of Highway 41 at the Breezewood exit. Both restaurants are worth your attention for great Mexican food. Their Website is www.soleamexicangrill.com/. In early 2011 or late 2010, they added a third location: 1104 Mutual Way, just west of the Fox River Mall, visible from Casaloma Drive in the site that used to be Tumbleweed and the Mesquite Grill. I visited Solea in Neenah in Jan. 2009 and was impressed with the remodeled building and the great service. Food was excellent. I tried the fish tacos and was pleased with the rich flavor and presentation. I took a vegetarian friend who had vegetarian fajitas (had to ask - they aren't on the menu). His dish was very good - except I think the grilled baby carrots didn't fit and they were still not cooked enough. There wasn't a less expensive lunch menu, as far as I could tell. La Solea changed owners in 2007 or 2008, keeping many of the great dishes that won me over and adding some new twists. It's all about flavor at La Solea. You'll start with their fabulous bean dip and nachos, and then get to choose from a wide variety of Mexican dishes that are closer to authentic than most other Mexican restaurants in Wisconsin. They still have the awesome bean dip that Los Compadres had (and still has in its new locations). The meals are not too expensive and full of rich flavor, including great guacamole. The Fox Cities have a strong selection of outstanding Mexican restaurants, with Solea Grill and La Solea being right up there with the best. Highly recommended! A popular pizza place at 110 N. Douglas Avenue, visible on the north side of College Avenue about 1 mile west of downtown. on College Ave. Their deep dish pizzas are said to be better than those of the famous Pizzeria Uno in Chicago (the place where deep dish pizza allegedly originated). They seem to focus on takeout business, but you can sit down and eat inside as well. Update: The calzones at Stuc's are said to be some of the best ever (a friend of mine says the sausage-onion calzones are especially terrific). Also received a strong recommendation for their tomato-chicken-basil salad. Very delicious, and large enough that it could be a meal for two, especially if you take it out. Stuc's has a terrific reputation for great food. Steak Escape is in the Fox River Mall and is a vital source of Philadelphia Cheesesteaks and other sandwiches. I'm told that their fresh-cut fries, cooked in peanut oil, are divine. This Thai restaurant on the east end of College Avenue offers an excellent menu with high-quality Thai food. The red curries are especially good. Sorry, no green curry. One possible problem: sometimes the service is extremely slow. Recently we were seated for over 30 minutes before we could even place our order, and it was another 30 minutes or so before the food came. After several experiences there, I have to say that I really like Texas Roadhouse. Yes, it's a chain, but clearly one of the most popular this part of Wisconsin has seen. This restaurant is designed to feed people well and keep them happy. And what food! Good steaks at some of the best prices I've seen, please a lot of other great choices. (I have had a complaint about their use of MSG there. Please inquire!) OK, for you gourmets, there are higher-end steaks that you can enjoy (for a lot more money). But even very expensive meat can be done poorly, as I recently experienced at Black and Tan Grille, shortly before it went under in 2011. So don't turn your nose up at the relatively sure thing you'll get at low cost here. They used to be open for lunch everyday, but now lunch is available Friday-Sunday. For the rest of the week, they're open from 4 PM to 10 PM (11 PM on Friday). See their hours on their Appleton location page. Since they are fun, delicious and inexpensive, the place is popular and often busy. If you're smart, you'll call before you get there to let them know you're coming. They'll put you on the wait list as if you had just walked in the door - you can do this for up to an hour before you arrive. On a Friday or Saturday, there might be 20 to 40 minutes wait, so it's good to call first. This worked out perfectly for us. But if you do have to wait, don't worry. They have a waiting room where you can eat all the salted peanuts in shells that you want, and you can just throw the shells on the floor. I guess that's supposed to be Texas style, but we Midwestern folk seem to get the hand of that right away. Also, while we were waiting, a girl came around with free samples of their delicious onion rings and dip for people to try. I like this business model: they work hard to keep you happy. Part of their secret is having lots of energetic and friendly employees. Even though the place was packed, we received a lot of personal attention from several staff members. Amazing service. Shortly after we were seated, we were brought wonderfully delicious fresh-baked rolls. Yum! We ate them in a hurry, so they brought us more.We placed our orders and were served surprisingly quickly. One of my sons and I shared a T-bone steak, one of the best I've had, while another son enjoyed a combo platter with steak and chicken, and my wife had a small sirloin steak that turned out to be the best sirloin I can remember. And we really enjoyed the side dishes as well. The chili, like all their side dishes, was made on site from fresh ingredients, not canned. The salad was fine, their green beans were wonderfully flavored, and the sweet potato was to die for - well maybe not die, but it's worth at least a mild stroke. A national chain - but a great one. Lots of atmosphere, unusual yet delectable food, and not expensive. Love the oddities on the wall and ceiling. By the Fox River Mall. Fairly noisy, though. Zacatecas is a popular Mexican restaurant in downtown Neenah. They offer some relatively authentic dishes with a good mole, good tacos, etc. I tried the enchiladas blancas recently and was pleased. I would call it Americanized semi-authentic, in my opinion, which is what a lot of people prefer. Good food, very good service, and a pleasant environment. Nice place for lunch, with your choice of a weekday lunch buffet or menu items. New sushi and Thai food restaurant on the southeast corner of Appleton, just east of Wal-Mart on Calumet, in the building that once was Luckie's and before that, Grazie's Italian. Very classy place with a mix of sushi, hot Thai dishes, and Japanese steak house service. Some of the best sushi in the Valley. I was wowed by the Thai eggplant dish. Very busy, very popular. Reservations recommended. Phone: (920) 831-8330. Address: W. 6157 Lorna Lane, Appleton, WI 54915. Zuppa's is in Neenah, just a few minutes south of Appleton, and gets my thumbs up as one of the best places for lunch. You order your food cafeteria-style at the food preparation area and carry it away on a tray, but don't let this casual approach fool you. Exotic salads, great pasta, good pizzas and sandwiches - a very robust selection that can satisfy almost anyone. Kudos to their talented chef. The selection of deserts is also quite tempting. And I like the relaxed, attractive decor. Two can have a delightful meal for $30 or less. Located at 1540 South Commercial Street (in The Shops at Mahler Farms), downtown Neenah. Phone: (920) 720-5045. Closed Sundays, and they close at 8 pm otherwise, so don't plan on a late meal. It's just south of the Copps near Commercial and Breezewood on the south end of Neenah, in a small strip mall. The understated sign makes it easy to miss - but don't miss this place! See their Website: Zuppas.com. These are some restaurants that might not appeal to me personally (or ones that I just haven't had the time or incentive to try), but may be worth considering. The Menasha Grille on Main Street in downtown Menasha offers some Cajun cuisine. I went there for there lunch buffet at the end of 2005. It was OK, but I found the flavors to be timid. I understand they do a better job for dinner, but haven't tried it yet. I tried the Golden Corral on Richmond Ave. in Appleton in 2010 for my first time. You can get a lot of calories for your money there--reasonable prices, lots of food--but it was unappetizing and disappointing on several levels. Don't think I can recommend it at this time. Another place that was "OK but disappointing" was Michiel's in Menasha, although I highly recommend Michiel's banquet hall in Appleton as a place for receptions. For those who prefer to cook their own food, Woodman's is the biggest store around. I like it for its great produce, huge selections, and exciting ethnic specialties (they even have yerba mate, the popular South American beverage). Visitors often are surprised to see the name of another popular chain, Piggly Wiggly. If you say it fast and keep a straight face, no one will trouble you. Copps, Festival Foods, and Pick 'N Save are also popular. For spices, Penzeys near the Fox River Mall is hard to beat. Incredible selection, low prices. In addition, there are many pubs and bars all over Appleton that also serve a variety of foods, though I personally avoid bars. Of course, there are many more great places to ward off hunger. For a quick treat, many people like Manderfield's Bakery. For those with a flare for Asian specialties, Appleton has several oriental grocery stores (catering primarily to the Hmong community). So many choices - so little time to eat! Outback has the best steak filets and the house salad with tangy tomato French dressing is great. Good Company's French dip sandwich is very good. Paradise Island has great smoothies and the excellent 1918 root beer. They have a 20oz frosted size. This root beer is only available on tap and is brewed in the Twin Cities. I have only been to the one on Ballard. The other location is in the Mall. Yeah, that sounds good. Like Appleton and the Fox Cities in general. A great place with a lot of good food, if you know where to look.